Andrea Vesalius was born in 1514. Considered the founder of modern anatomy he based his studies on direct observation and surgical practice, rejected a number of anatomic inaccuracies from previous thinkers, above all Galen of Pergamon, the prominent Greek physician, surgeon and philosopher from the Roman empire, and made new discoveries, revolutionising the scientific circles of the time. He receives his early education in Brussels and Leuven where, among other classes, he takes Latin, Greek, Arabic and Hebrew. At 18 he moves to Paris to study medicine. He stays there for three years (1533-1536) in an environment very much focused on Galen’s teachings. Jacobo Silvio and Günther von Andernach head up the teaching of anatomy. Vesalius, greatly seduced by the subject, tries to complete his formation in osteology with bodies exhumed from the Cemetery of Innocents and he participates a number of dissections with his colleague Miguel Servet. The break out of the war between Francisco I and Carlos V takes him back to Leuven, where he remains for two years (1536-1537). He receives his degree in medicine there, doing tens of dissections and publishing his first work: Paraphrasis in nonum librum Rhazae ad Almansorem (1537). He then goes to Italy, first visiting Venice, where he meets his future collaborator, Jan Johannes Stephanus de Calcar, and then moving to Padua to enter the medical school there. 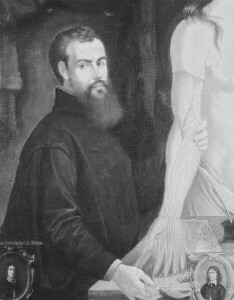 In Padua he earns his doctorate on December 5 1537 and the next day is named Explicator chirurgiae or Professor of Surgery, his responsibility bring the teaching of surgery and anatomy. 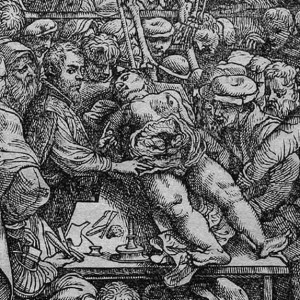 Then Vesalius does something unforeseen: he goes against the conventions of medical teaching by getting off his chair and leaving the lectern to stand beside the corpse, where he himself then dissects and shows his students the part he is referring to in his explanations. He also uses diagrams to show them the things that are difficult to see in the body. As a result, Vesalius notices that Galen, the final word in anatomical knowledge up to that point, made various errors because his studies were based on the dissection of animals rather than humans. He decides therefore to disregard Galen’s works in the teaching of anatomy. This causes a great stir in the faculty at Padua and compels Vesalius to write a new treatise on anatomy. In 1542 he writes his famous De humani corporis fabrica. The work provokes an angry response from a few Galenists. One such fierce assault on Vesalius comes from is his own teacher from Paris, Jacobo Silvio, who calls him shameless, impious, slanderous, and ignorant. Soon after he is named Carlos V’s doctor, and follows him on his travels throughout Europe. Their relationship is so tight that Vesalius dedicates his work to the sovereign and presents him the first published copy of the fabrica (bound in imperial purple silk with special hand-painted illustrations which cannot be found in any other copy). With the abdication of Carlos V, he passes to the service of Phillip II, moving to Madrid in 1559. During his stay he maintains difficult relations with the rest of the doctors in the royal household and with the Spanish church, who disagree with the dissection of human bodies. He is eventually condemned to the stake by the Inquisition, accused of shady practices that remain unclear. However, Felipe II changed this ruling to a pilgrimage to the Holy Land, which Vesalius takes in 1564. He sets sail with the Venetian fleet Giacomo Malatesta going via Cyprus. On arrival in Jerusalem he receives a message from the Senate of Venice requesting him to accept his old position in the University of Padua, which has opened up after the death of his friend and student Falopio. However, the boat that takes him back is in poor condition, only just weathering a great storm, and the crew and passengers suffer all kinds of illnesses. On arrival in Zante, Vesalius is unwell and he dies shortly afterwards, at only just fifty years of age.